This recipe was passed down from my great grandmother, and I’ve adapted it slightly. This makes a great family treat, and the kids can help add flavor. Mix all ingredients thoroughly in a large mixing bowl. It’s a good idea to sift the flour into the bowl to reduce lumps, and mix the batter with a whisk. 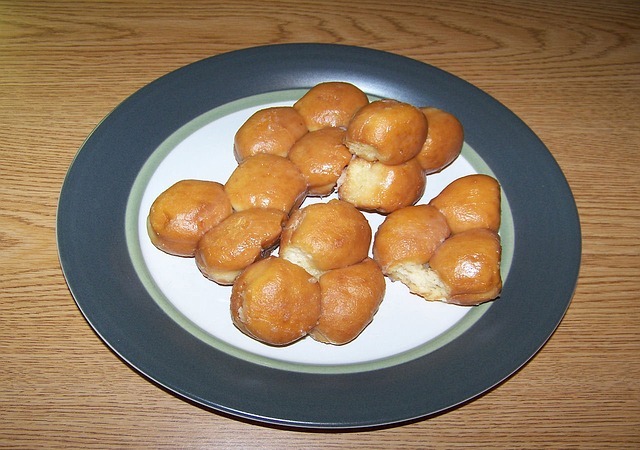 Drop only 3 or 4 doughnuts at a time to keep them from connecting. Wait about 1 minute, and then turn each one using a curved fry spatula. Wait another minute, and remove them (if they are browned. If not, give them just a little longer, turning them often.) Drain on paper towels. You’re likely to get some odd shapes dropping the doughnuts by hand. This can actually be a lot of fun for kids to see and try to imagine what the shapes look like. Once you’re good at cooking them, you can even try making shapes on purpose. For variety, you can try various types of flavoring after the doughnuts are cooked, but not completely cooled. For sugar-cinnamon doughnuts, simply mix ½ cup sugar & 1 tsp. Cinnamon in plastic bag and shake the doughnuts in it as soon as they come out of the oil. You can also use cocoa, powdered sugar, or colored sugar as coating. If you have a cooking syringe or pastry bag with a small tip, you can inject all sorts of things inside your doughnut drops. Try things like fruit jelly, lemon pie filling or any flavor of pudding. It can take a few tries to learn how to add enough filling without adding too much, but once you learn, the possibilities are endless. You can even combine filling and coating for really unique donut drops.